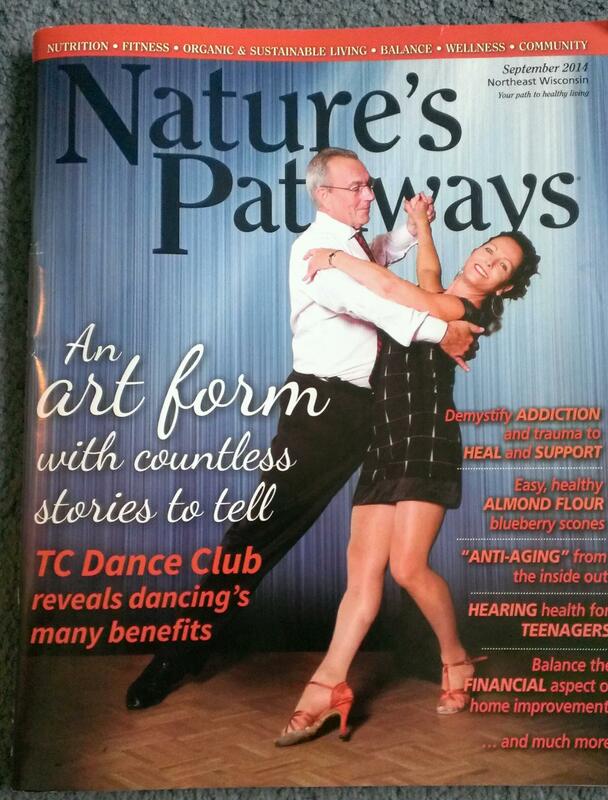 Congrats to Terry Irwin, of TC Dance Club for the wonderful spotlight done on him and the studio in the September issue of Nature’s Pathways September 2014 Northeast WI edition. Terry joined our Dancing with Our Stars for the American Red Cross team of pro dancers and studios in 2013 as the choreographer and coach of star dancer, and 2013 Fundraising Mirror Ball Trophy winner Betina Driver and her professional partner and husband, Donald Driver. Last year Terry danced with Stacy Struck of Jack’s Maintenance Service. We are honored to have Terry partner with us again in 2015 for his skills, talent and professionalism. All his hard work was rewarded. Terry Irwin, pre-med student at Case Western Reserve University, had just earned a scholarship to Johns Hopkins University Medical School. He was well on his way to becoming a doctor and fulfilling a lifelong dream. Just one problem: That dream wasn’t Terry’s. The summer before he was set to start at Johns Hopkins, Terry was working with a friend who lived across the street. After spotting an ad in the paper, she teasingly wagered $15 that Terry couldn’t get a job at Arthur Murray Dance Studio. That simple bet led Terry to discover his true calling — one that would change his and many others’ lives. “I took the bet, went in, found out that I loved it and realized that I really didn’t want to be a doctor. That was my mother’s dream, not mine,” Terry says. He turned down the Johns Hopkins scholarship and never looked back from his newfound love of dance. Even though he’d found his dream, it wasn’t always smooth sailing for Terry. While training to be a dance teacher, he was cut from the class in the very first week. He decided to show up anyway at the next session. The story was the same for six weeks in a row, but still he stuck with it. He stuck with dance despite failing the tango and samba portions of his first teaching test. He stuck with dance despite having to work in telephone marketing — a side job he hated — while training. The result? Terry became an award-winning competitive dancer and — even more importantly in his eyes — he discovered how to teach his students in a way best suited to bring joy to each of them. Through the years, Terry’s competitive dancing, instructive skill and choreography have given him the chance to work and befriend many big names: Cheryl Burke, professional dancer of “Dancing with the Stars” fame; former Green Bay Packer Donald Driver and professional dancer Peta Murgatroyd, winners of the 2012 “Dancing with the Stars” competition; Frankie Valli & The Four Seasons; Dorothy Benham, Miss Minnesota 1976 and Miss America 1977; and even former Prime Minister of the United Kingdom Margaret Thatcher. Terry also had the honor of choreographing Bob Hope’s last USO tour. A photo of the two men hangs in TC Dance Club’s hallway. Just as important for Terry, though, are the opportunities dance has given him to work with local students: people like DeLila Nock, who started dancing at age 74. The two became fast friends and when she was in her 80s, Terry promised DeLila that they would dance together on her 100th birthday. Sure enough, they did just that; dressed in a blue and sequined ball gown, DeLila cut quite the figure as she glided around the floor in Terry’s arms. This connection to the community and his students is what makes everything worthwhile. Do yourself a favor and visit TC Dance Club today.